After riding his bike from Imperial Beach to Jacksonville, Florida, as part of a fundraising effort, Thomas Pittman returned to San Diego. SAN DIEGO (KGTV) - After 36 days, nearly 2,500 miles, ten flat tires, and nine states, a Cal Fire engineer has returned home to San Diego. 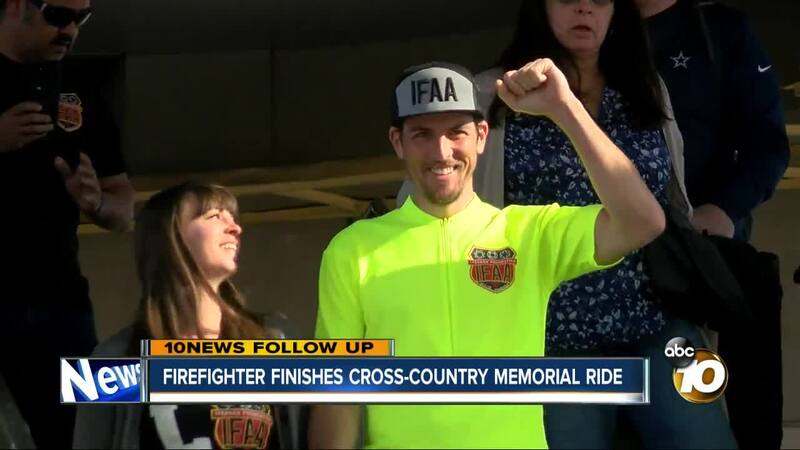 Thomas Pitman embarked on the cross-country journey January 1 in honor of fallen firefighter Cory Iverson, who died while battling the Ventura County Thomas Fire. Pitman departed from Imperial Beach and ended in Jacksonville Beach, Florida. “Finishing at the end, I was not prepared for it, the emotion, I didn’t have words to speak, even now it’s hard," said Pitman after returning to San Diego. Throughout the 36 day trek, he raised money for the Iverson Foundation for Active Awareness (IFAA) . The foundation was started by Cory's wife, Ashley, to provide peer support and mental health programs for emergency first responders. Pitman described his friend and colleague as a phenomenal human being, the best type of friend you could want, and a great family man. Pitman says he was surprised and humbled by the outpouring of support along the trip. "Comes to a culmination, the thought of finishing something so tremendous, the thought of what you’re doing it for, the thought of the people that are coming out to support you," said Pitman. Pitman returned to San Diego with a warm welcome, his fire family and loved ones greeting him at the San Diego Airport. He's raised five-times his original goal of $2,426, with more than $12,000 so far. You can still donate here.